The Boston Public Library announced today that it has posted online the Chronique Anonyme Universelle, or “Genealogy of the Bible,” a 35-foot illuminated scroll dating from 1470-1479. The manuscript traces the genealogy of biblical characters and royals from the creation of the world to 1380. 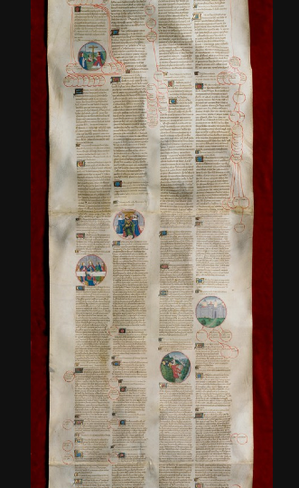 The scroll, conserved by the Associates of the Boston Public Library and digitized by Boston College, is part of the BPL’s Medieval and Early Renaissance Manuscripts Collection of Distinction. Image: (Detail) Chronique Anonyme Universelle. Via BPL’s Digital Commonwealth portal. The Boston Public Library announced today that it has posted online the Chronique Anonyme Universelle, or "Genealogy of the Bible," a 35-foot illuminated scroll dating from 1470-1479. The manuscript traces the genealogy of biblical characters and royals from the creation of the world to 1380. The scroll, conserved by the Associates of the Boston Public Library and digitized by Boston College, is part of the BPL's Medieval and Early Renaissance Manuscripts Collection of Distinction. "It is our great pleasure to share the Chronique Anonyme Universelle in its entirety and to bring viewers back to a significant time period that explores so many elements of our collective history," commented Tom Blake, Digital Projects Manager, in a statement released today. "Boston Public Library is proud of our ongoing commitment to digitize our collections and connect audiences with a breadth of items they may not see otherwise." Image: (Detail) Chronique Anonyme Universelle. Via BPL's Digital Commonwealth portal.